Export credit slips list with to CSV - exported fields include total values for products and shipping (if repaid) and tax details for every tax type used in credit slips, separated by product and shipping taxes. List of credit slips can be created based on advanced filter keys. Keys can be used simultaneously. For example, you might need to search for credit slips of the certain customer, created within the specific date interval. 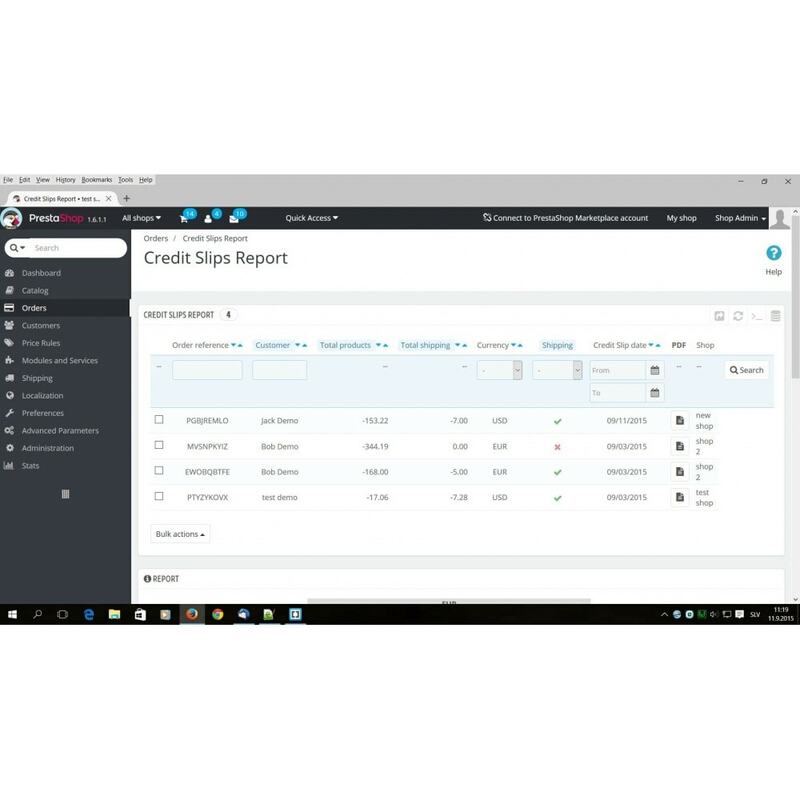 All listed credit slips or individually selected credit slips from the list can be downloaded to PDF with one click. List of credit slips with tax details for individual credit slips can be exported to CSV file. 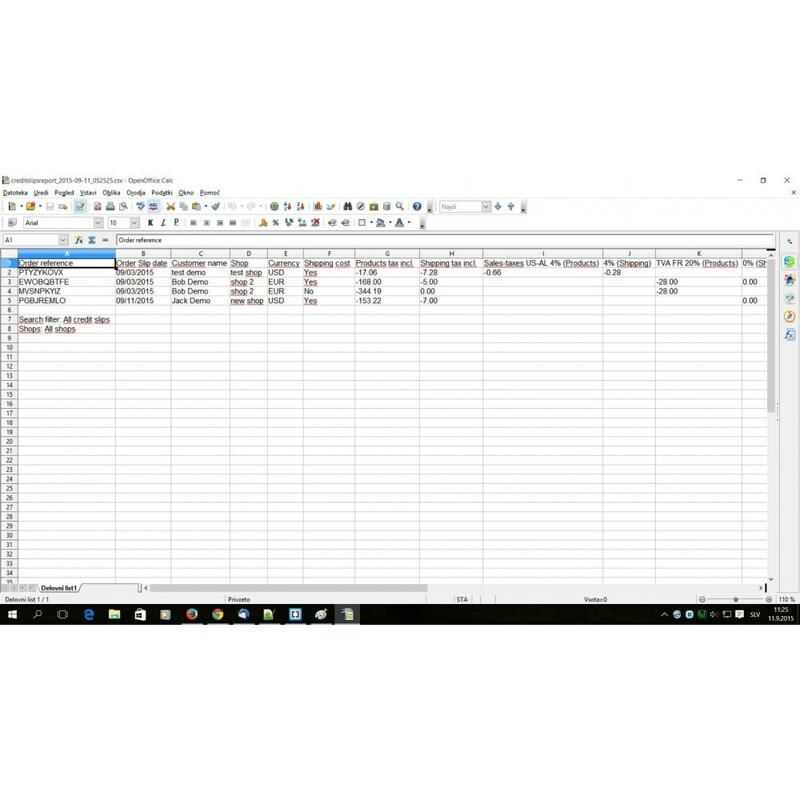 Data can be imported from CSV file to Excel or Googledocs sheet or any other CSV supporting application. Exported CSV file contains detailed data for individual credit slips. All columns displayed in the browser are also exported to CSV. Additionally, tax details of every exported credit slip by tax names and tax rates, specified separately for tax on products and shipping are also exported to CSV. 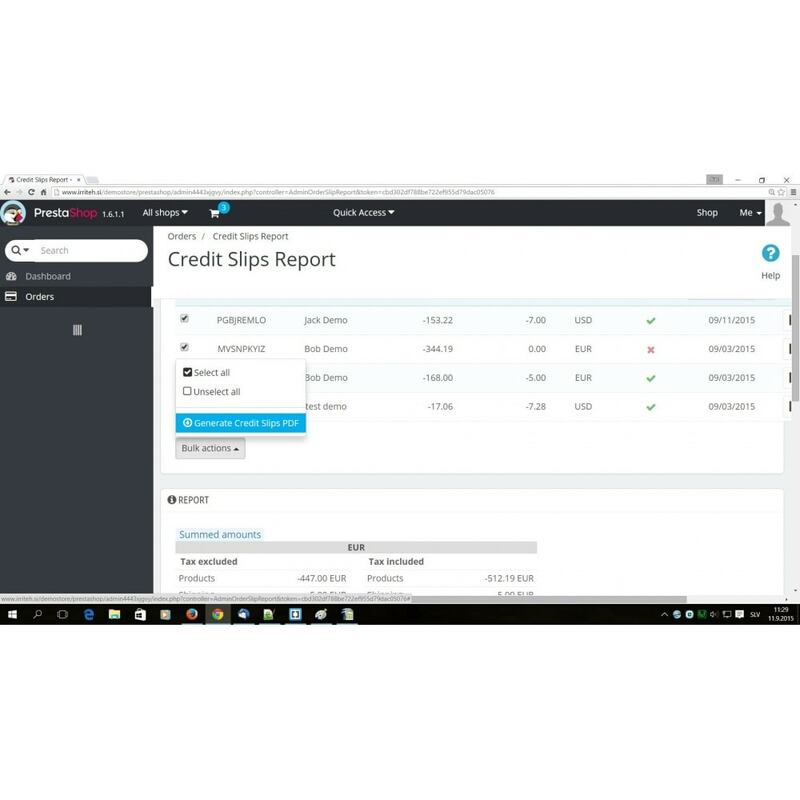 For the list of credit slips, report is generated automatically and displayed in the browser bellow the list. Report displays summed values for listed credit slips (tax excluded and tax included) for products and shipping. Tax details are displayed by different tax tyes and tax rates, separatelly for taxes on products and shipping. List of credit slips with report can be exported to PDF file. Details on search filter are written to PDF, so it is clear what search filter was used to generate the report when PDF is printed or sent to 3rd parties. If there are credit slips with different currencies in the list, separate calculations is made for each currency. Multiple currencies are supported - when there are credit slips issued in different currencies, report calculation is groupped by currency (values are summed separately for each currency). Module is dynamic - not bound to any local settings. It supports any taxes, tax rules, currencies etc., that are used in your store. All values are read from your database and displayed dynamically. By clicking button Download PDF button, a complete document including the list of credit slips and summed amounts is generated. Enabled fields will be displayed in the web browser, in PDF report and exported to CSV. 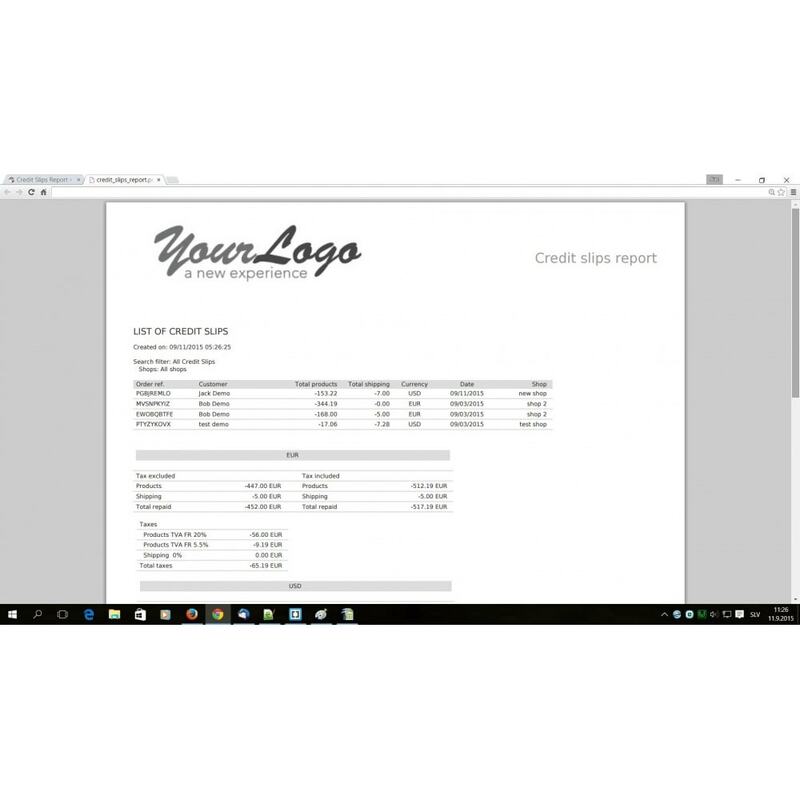 You customers can get detailed report on credit slips for their orders. Note: This module does not provide any front office functionallity directly accessible to your customers. But you can for example inform your customer that report on their credit slips can be sent to them on request by sending them PDF or CSV file.